The Center of Excellence for the Treatment of Barrett’s Esophagus is an alliance of numerous professionals from several clinical institutions, research organizations, and supporting services, providing comprehensive and well-coordinated care for patients, as well as conducting preclinical and clinical research. This partnership has resulted in the introduction of new treatments for patients and the development of new technologies for early detection of cancer. A complete description of different components of the program is provided later in this section. Photodynamic therapy for Barrett’s esophagus with high grade dysplasia was pioneered in 1990 at our center, which is located on the 4th floor of the Thompson Cancer Survival Center in Knoxville, TN. Ours was one of the first institutions to introduce BÂRRX procedure for treatment of Barrett’s esophagus and has treated more than 1400 patients so far. Over two decades of experience has resulted in excellent treatment outcomes in our patients (see Publications By Our Staff). The center is an state-of-the-art outpatient endoscopy facility equipped to provide an array of treatment options for patients with Barrett’s esophagus to include radiofrequency ablation using a variety of HALO devices (also known as BARRX procedure), endoscopic mucosal resection (EMR), cryotherapy, laser treatment, and bipolar or monopolar electrocoagulation. Diagnostic procedures such as endoscopic ultrasound (EUS) for staging of disease as well as Bravo pH monitoring for GERD patients are also used routinely. Our Center of Excellence is internationally known as a leader in the treatment of Barrett’s esophagus. We gained this reputation as a result of innovations in protocol development, excellent treatment outcomes in a large number of patients, numerous publications and book chapters, and numerous presentations. The light delivery balloon for PDT was initially tested in our laboratory at the University of Tennessee’s College of Veterinary Medicine, and the clinical development of the balloon followed at our center. This work led to a multi-center international study for treatment of HGD in Barrett’s esophagus, which was conducted under the direction of our center’s medical director. Patients come to our center from all areas of the United States and from other countries. To date, patients have traveled to the Center of Excellence from 44 states and several foreign countries. In fact, 25% of patients enrolled under the multi-center international PDT study were treated at our center. We are routinely invited to participate in preclinical and clinical trials of new treatments. The clinical staff regularly chair and moderate national and international conferences and serve as reviewers for medical and scientific journals where related papers are published. The Center of Excellence is committed to improving patient care and treatment outcomes through research. The clinical research program has been active since 1989 investigating numerous photodynamic therapy protocols and ablation procedures such as radiofrequency ablation and cryoablation. Through clinical research, our Center has obtained extensive experience in treating Barrett’s esophagus and early esophageal cancer as well as in lung cancer, skin cancer, metastatic breast cancer, Kaposi’s sarcoma, and other cutaneous cancers. detection of cancer in Barrett’s esophagus and skin cancers such as basal cell carcinoma and squamous cell carcinoma. Our center was a national training facility for treatment of Barrett’s esophagus and esophageal cancer where trainees learned the proper application of photodynamic therapy for Barrett’s esophagus. Our hands-on teaching laboratory located in the College of Veterinary Medicine was used to train physicians and nurses in an animal model. Physicians and nurses from many prestigious medical centers received training at our institution. Patient education is strongly emphasized in our program via personal phone discussions between our patients, physicians and staff. An extensive array of brochures and other informative material is mailed to patients before they come for treatment. Prior to the procedure, the nurse and doctors contacts the patient and discusses the treatments in detail. Ample opportunity is provided for the patients to ask questions. Continuous comparison of outcomes against external benchmarks is achieved via publications, presentations, and literature reviews. Our faculty have published extensively in medical and scientific journals along with several book chapters and review articles (see Publications By Our Staff). This allows for face-to-face interaction with other physicians and scientists. Our Medical/Nursing Research Library, located on the 3rd floor of the Thompson Cancer Survival Center, conducts monthly searches of the published articles to keep abreast of the latest developments in the field of Barrett’s esophagus. All patients are mailed a satisfaction survey along with a self-stamped return envelope. Patients are asked to rate all aspects of their care and assign an overall satisfaction score of 1 to 10, with 10 being very satisfied. 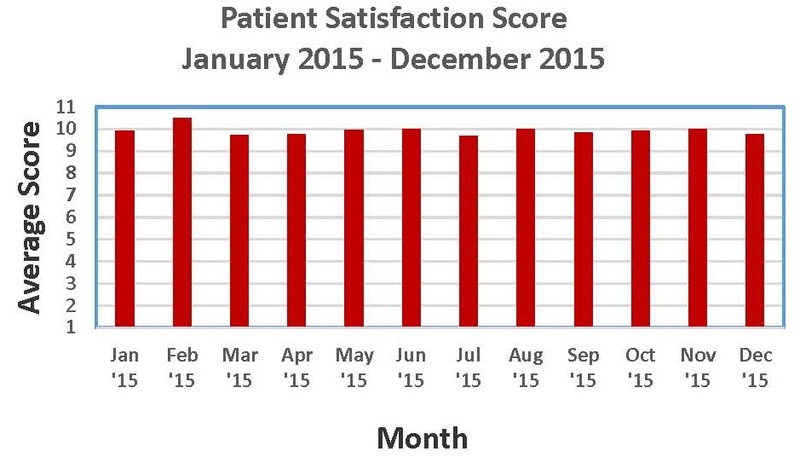 The charts below show the monthly average scores for 2014 and 2015. 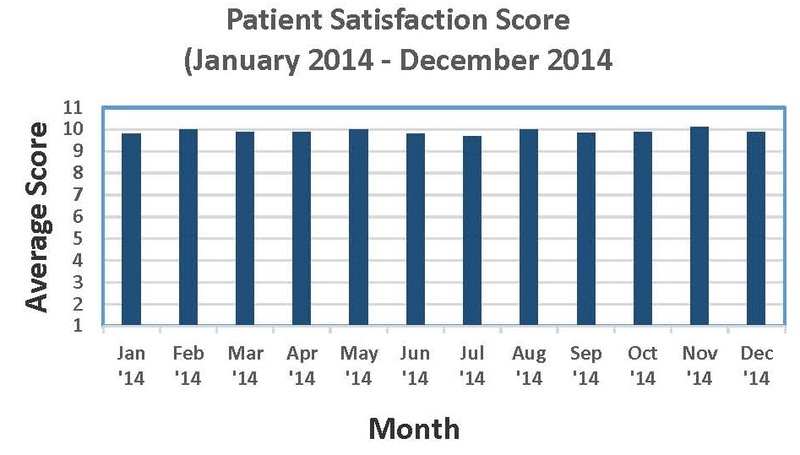 Often patients assigned an overall satisfaction score of 11 or higher, pushing the average monthly score to higher than 10, as seen for February 2015. These high satisfaction scores are the result of 27 years of clinical experience concentrating on treatment and follow-up of patients with Barrett’s esophagus. We continuously strive to meet every need of our patients. Ancillary services such as laboratory, radiology and patient and family support are provided within the Thompson Cancer Survival Center. In the rare case of an emergency, inpatient services are available at Fort Sanders Regional Medical Center, across the street from the Thompson Cancer Survival Center.